In Treatment: "Sunil: Week 5"/"Frances: Week 5"
"Sunil: Week 5"/"Frances: Week 5" / "Sunil: Week 5"/"Frances: Week 5"
"Sunil: Week 5"/"Frances: Week 5"
There's nothing quite like a ticking clock to add drama where previously there was none. Take a bunch of people sitting around a table and squabbling about their relationship, and it's not horribly interesting unless particularly well-written or well-acted. But take those people and add in the knowledge that one of them has cancer and will die in a few weeks or one of them is planning to murder another or one of them has planted a bomb under the table (thanks, Hitchcock), and you get an instant sense of propulsive suspense, of drama getting ever more intense. When we've talked about "stakes" this season, this is often what we're talking about. Maybe we're afraid that one of Paul's patients will kill him or herself if he doesn't help them in time. Maybe we're afraid they won't be able to deal with their guilt. Or maybe it's something as simple as Paul not being able to save a marriage unless he works his magic quickly enough. These are all examples of ticking clocks. There hasn't really been imminent danger this season. Sure, all of these characters are in moments of crisis, but they're much smaller-scale crises. There's no imminent danger, just a general sense that if things don't get fixed, something could go wrong at some point. Last week, the show sort of turned the corner on this, pushing the stakes a bit higher. Tonight, though, the show makes the stakes positively concrete. Sometimes, it's forcing the issue just a bit, but I can see why it would feel it might have to do this. It's easier to make Sunil's story exciting when it seems like he might snap and kill his daughter-in-law (or at least injure her) at any given moment. It's easier to make Frances' story interesting when it seems like she might miss her sister's long decline, the same as she missed her mother's. Neither of these stories is "WE HAVE TO SAVE THE EARTH!" style high stakes, but each is high stakes in its own, neatly personal way. If week four is the week where the story becomes sharp and clear, week five is the week when In Treatment figures out some way to bring everything to a crisis point. And it more than did that with tonight's Sunil and Frances episodes. As always, the Sunil episode was more gripping. (Despite my personal attachment to the Jesse storyline, I do think the Sunil half hours have been the strongest overall, from a purely objective standpoint.) This week, though, Frances had some nice moments as well, and while she's still the patient I feel most distant from, I think the show is doing a nice job of shading her in as it goes along. She may be making a late rally. There are moments in each episode that seem to force the drama just a bit, as if the show doesn't know an organic way to introduce some of these issues, but that's a small quibble, ultimately. Sunil: The supporting actor in a drama category is always pretty stacked at the Emmys, and there's a tendency to go for actors who are well known outside of television or actors who are on widely watched shows. 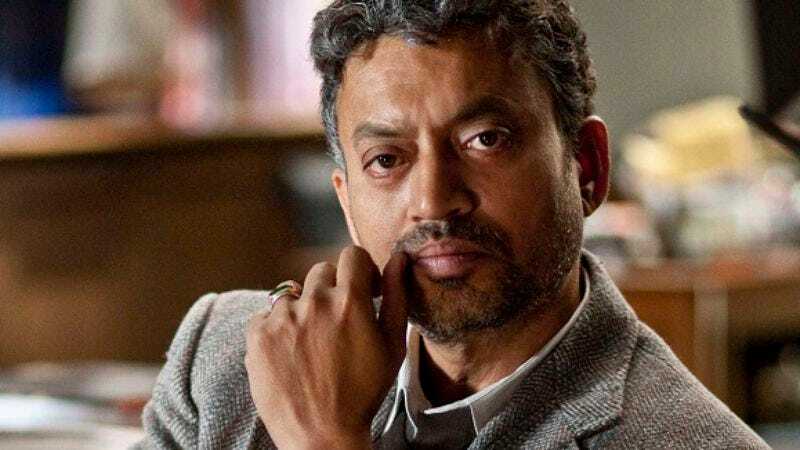 But if the academy doesn't nominate Irrfan Khan next year for his work as Sunil, there's something wrong with the process. Khan is taking a character who could be difficult for audiences to understand on a psychological level and making him crystal clear. He makes a bunch of swift mood shifts in tonight's episode that should sort of beggar belief, yet he sells absolutely every single one of them. He makes Sunil's anger, his sadness, and his desperation all crystal clear, and he mixes them perfectly, as when he's talking about how powerless he feels in the face of the monsoon floods wiping out the place where his parents were born. There's a lot to take in in tonight's episode, and most of the heavy lifting is on Khan (Gabriel Byrne gets to sit back and watch, much of the time). And somehow, he nails it. The episode's opening deals with those floods, which seem to send up an even greater sense of urgency in Sunil than usual. Now, everything he says about how he hates America or how he hates living with Arun and Julia is tinged with even more of a sense that he never should have left India. Sure, he could just have Julia cut a check in his name, but that's not really helping to him. Helping would be getting into the muck and helping the less fortunate dig their way out. Helping would be still being in Calcutta, where he could feel attached to the world and people he left behind. Helping wouldn't be having to live in a place where no one talks about the flooding on the radio and, instead, talks about Amare Stoudamire incessantly. There's a subtle thread of isolation linking both the Sunil and Frances episodes tonight, but it's much more pronounced here, as American culture lets Sunil down again and again. He can't interpret Julia's friendly goodbye to the author as a friendly goodbye, choosing instead to see it as needless intimacy. He can't understand why not everyone is as obsessed with thoughts about the flooding as he is. He can't grasp just why Paul would want him to come in more than once. Increasingly, he's cornered, and Paul's fear is that he might lash out. In the very first episode of the Sunil story, Sunil asked if Paul would ever tell others what he had said in the session. At the time, I made a note of it, wondering if the show was just bringing this up to set up a situation where Paul had to do just that later on down the line. In a way, I'm disappointed that the storyline has played out in a way where it seems as though we're going to see that scene (probably next week). But in another way, it's been so fascinating to watch Sunil unravel as Paul helps him uncover so many of the things he's kept buried that I don't mind. When Sunil talks about his dream of pulling off his son's arm to protect him from the woman who's advancing on them (who may or may not be Julia and may or may not be Malini), sure, it could be read as a little too obvious a symbol of the problems in Sunil's life. But in Khan's hands and as scripted by Adam Rapp, it's not really something you think about until the half hour is over. In other words, who cares if the personality shifts are so dramatic, if the actor handling them is so good? Frances: One of the reasons the Frances episodes may seem to lag behind the other three episodes is because they're so much shorter than all of the others! Week after week, the Frances episode is the shortest of the four, often by three or four minutes, time that would really help shade in the character more. Tonight's Frances episode is probably the best yet, but it's still curiously uninvolving through much of its runtime. Frances discovering that she does not carry the gene that will make her that much more likely to get breast cancer should feel like a huge, huge moment, but it feels as muted as everything else in this story, and I'm hard pressed to put my finger on why. But I think this episode length thing might be a part of it, though this one is actually shorter than most. To a degree, all of In Treatment is exposition. The characters sit down and talk about what they're thinking, launching into long stories from their past, stories that neither we nor Paul know about. Now, granted, these stories are the lifeblood of the show, and it doesn't work without them. Part of the fun is picking them apart, trying to figure out what Paul will have to say about them or being amazed by, say, Sunil's admission of his affair with Malini and the deep reservoirs of emotion contained therein. It's all exposition, but it's also all storytelling. (That's all exposition is, anyway.) The Frances episodes suffer because on top of all of the exposition she has to dole out (including a lot of intricate family connections, most of which have failed her), she only gets around 21 minutes each week to talk about it. Similarly, Paul's so familiar with her sister that we really only get to hear about the ways that Tricia has failed Frances, which means she doesn't feel as fully fleshed out as she should be to be the catalyst of this particular story. That said, there are enough nice moments in tonight's episode to make up for it. Frances realizing that her daughter is a grown-up was well-done, and I liked the revelation that Tricia had claimed Paul was in love with her (really, it was the reverse). But the story of Frances going home with a younger man and realizing how YOUNG he was felt a little too similar to the same thing happening last season with the Mia character, who did something very similar, if not exactly the same. And maybe, ultimately, that's why this story just doesn't work as well as it did for me last year: Mia was too similar, in a lot of ways, and it's hard for Frances to move out of her shadow, acting and all. I do hope she goes to see Tricia on her hospital bed, but I don't FEEL it as acutely as I should be.